Monitoring wombats for behaviours such as pacing and rump biting could help conservation efforts by increasing the success of captive breeding. University of Queensland researchers have found increased pacing by female southern hairy-nosed wombats is an indicator they are 'in season'. And female wombats are more likely to bite the rumps of the males in pre-copulatory behaviour at the most fertile phase of their reproductive cycle. Associate Professor Stephen Johnston said researchers were trying to better understand the southern hairy-nosed wombat as a breeding model for their critically endangered northern cousins. "With only about 200 northern hairy-nosed wombats remaining, being able to breed these animals may one day ensure the survival of the species," he said. 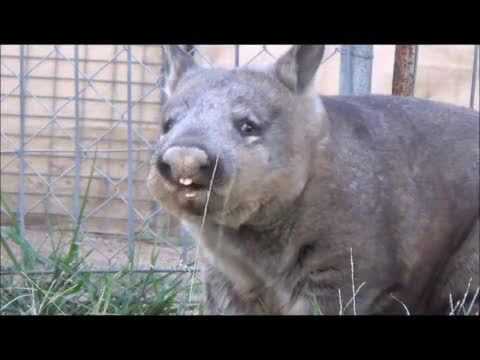 "There has been no captive breeding of the northern hairy-nosed wombat, and even the southern species fails to breed regularly in captivity." Dr Johnston said the size and aggressive temperament of wombats made them difficult to work with, so behavioural indicators were a significant step forward. "We have developed a way to map the reproductive cycle of the female wombat by measuring hormone levels in their urine," Dr Johnston said. "Through round-the-clock monitoring over multiple breeding cycles, we detected subtle behavioural changes associated with the fluctuations in this hormonal mapping. "These behaviours could be used to identify when animals in captivity should be brought together for breeding, serving as cues for animal husbandry managers in zoos and wildlife facilities with southern hairy-nosed wombats." The research team, including Dr Alyce Swinbourne, worked with Australian Animals Care and Education, from their Safe Haven base at Mr Larcom in Central Queensland. Dr Johnston said that detection of the most appropriate timing for successful mating in the wombat was important not only for natural conception in wombats, but also for the next step in the research program, which involves the development of assisted reproductive techniques such as artificial insemination. The research is published in Reproduction, Fertility and Development by CSIRO Publishing.